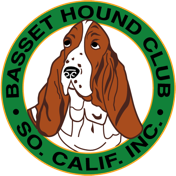 I'd like to personally welcome our members and guests to the website of the Basset Hound Club of Southern California, Inc. 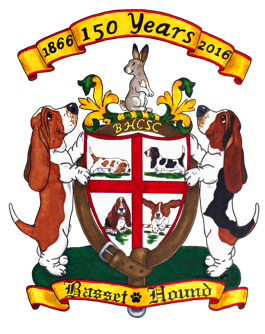 This club was formed by a group of basset hound fanciers in the 1950s to assist in protecting and promoting our wonderful and unique breed. Since then our members have been carrying on their legacy. Unlike many breed clubs the BHCSC welcomes all who own basset hounds and even offers associate memberships to those who don't. Don & Heidi in their favorite chair. This better acquaintance and closer study of the Basset have compelled a change in the view taken of the breed, and most unprejudiced persons are now ready to admit that these hounds possess characteristics worthy of the admiration of both sportsman and dog-lover. While most of us fit into the dog-lover category many of the basset hounds today can actually go out in the field and hunt much like they did back then. There are people today who hunt with basset hounds or least take them out in the field to track game. Our club is very active in supporting Basset Hound Field Trials where bassets can do what they were bred to do. The showing of basset hounds has a very long history. The show in Paris, France in 1863 is the first one that we know of that bassets were shown in. Even as early as 1880 there was a class at dog shows in the United Kingdom for basset hounds. In 1885 Mr. Everett Millais judged an entry of 120 bassets at the Royal Aquarium in Westminster, England (not to be confused with the Westminster Kennel Club in New York). Through our club's shows and matches we are working to do our part to keep this history of breeding and showing better bassets alive and well. We encourage our member breeders to follow a code of ethics in their breeding efforts. In addition to showing the club supports and works directly with groups who save bassets that need to be protected. Whether it's a basset in need of medical attention or one that needs a new family and home these groups are there to lend a hand. As a club and as individual members we support these groups financially and by helping out when we can. Our club is doing its part to educate the public about our breed. This is an area where great confusion exists. Part of the reason we have so many bassets in need of being saved is the lack of knowledge that many have about our breed. For many years the club has published our monthly newsletter, Basset Tales, which has articles about the breed and other helpful information. At our annual Basset Hound Picnic over the years the club has provided educational materials and opportunities for those who attend to learn more about our breed. We also established this website to help educate the public. It actually reaches far beyond our membership. We know there are people all over the Unites States and other countries that follow what we do. Some of them and others have also found our BHCSC Facebook page. That's something that we hope to expand in the future. Public education is paramount in helping to promote and protect our breed. I would encourage all our members to become more involved in the club's activities. While I realize that many of you don't breed or show there are other activities you can get involved in. 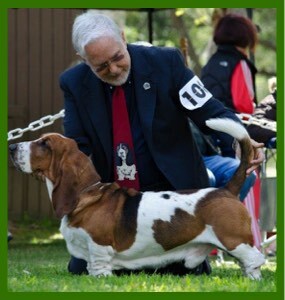 All AKC activities, other than dogs shows, are open to all basset hounds, even those that aren't AKC registered. Even if you don't want to train your dog for any of these AKC events you can still be involved with the BHCSC. We are always in need of helpers at our shows and other events. Having a dog that's participating in the event isn't necessary for you to offer to help. In fact by lending a hand you would be allowing those who are entered the opportunity to concentrate more on their dogs. It would be a great way for you to support our club and basset hounds. Our wonderful breed as we know them today has been around for well over 150 years. Some forms of bassets were around as early as the 1500s. It's part of our responsibility to continue our support for them for the future. If you are interested in joining our club or becoming more active in the club please don't hesitate to let me know. I welcome your comments as well. I certainly wish you and your bassets the best. May you continue enjoying this wonderful breed of dogs. Please give them some hugs and kisses from me. I hope to see you at our BHCSC events. On a more personal note some of you may be wondering how someone like me got involved with basset hounds. I've included a page that explains how Pam and I started out in the breed (LINK). Don with Caicos at the 2014 BHCSC Specialty. For more information on Basset Hounds and the BHCSC you might want to check out our Blog. It is used to address current ideas and concerns about the breed as well as provide important information to our members and encourage others to become involved with the club. In 2016 we celebrated the Basset Hound by highlighting the contributions of Lord Galway of Serlby Hall, Nottinghamshire, England in 1866. This was a sesquicentennial celebration of the first use of the name Basset Hound in writing in England, the first imports of our breed into England and the beginning of the continued breeding Basset Hounds on a scientific basis. This is just one of the significant events in the history of our breed as we know it today. I'm currently working more detailed historical information on basset hounds for this website. It's an ambitious project that will be coming soon. The goal of our club can be summed up in it's purpose. This website is designed to help carry out this task. We are so fortunate as a club to have a group of dedicated, responsible breeders who, 150 years after Lord Galway bred his first litter, are carrying on his legacy. They are all dedicated to doing their best to breed Basset Hounds based on the written AKC Standard for our breed. Through efforts like theirs and similar breeders all over the United States and many countries we are able to have the breed that we all love so much. For information on showing Basset Hounds click on the following link. While it takes books to cover this subject in any depth another history is available as a pdf file that can be downloaded. Please understand that this is a work that is still being edited and additional information needs to be added. For those who are interested in taking a sneek look at the project here's a special link to the Basset Hound History directory (LINK).